La Roche Posay Effaclar H Cleansing Cream 200 ml order online. 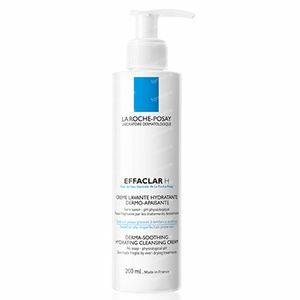 La Roche Posay Effaclar H Wascreme is suitable for oily fragile and dehydrated skin because of anti-acne treatments that dry the skin. Dermatologically tested in combination with drying treatments. Non-comedogenic. Cleanses and purifies the skin gently and improves skin comfort. Innovative texture "no rubbing": place a little bit of this product in the palm of your hand and let it foam with water. Apply it on your humid face, in one movement from inside to outside. Rinse thoroughly and dry without rubbing. Avoid the eye area. in case of contact with the eyes, rinse thoroughly with water. I bought this a little while ago and just started using it, so it's difficult to say whether it will change something or not. But I have faith in this brand and this product feels very pleasant.